You asked for vacation rentals, so we delivered! We’re thrilled to announce that Travefy now serves over 500,000 amazing vacation rentals across the globe. 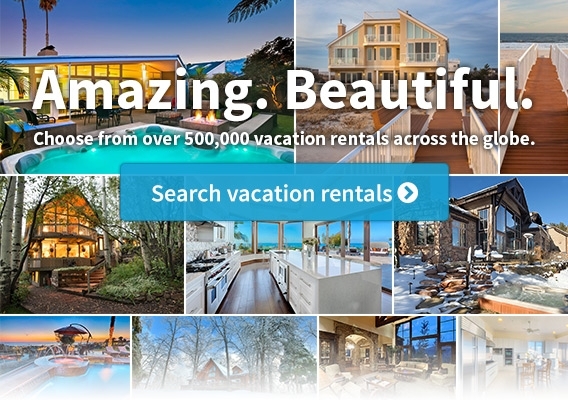 Search, book and add these vacations rentals to your trip itinerary just like you can with the millions of restaurants, activities, events, and hotels currently served. Even more exciting, you can use Travefy to split the cost of your vacation rental booking and collect payments from your group. Never get stuck with the bill again! How to find the perfect vacation rental! 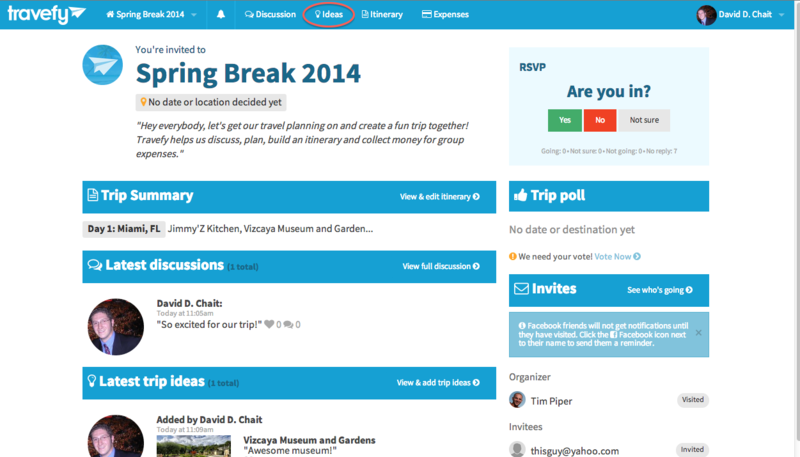 When inside your awesome Travefy trip, simply click the “Ideas” tab at the top of the screen. 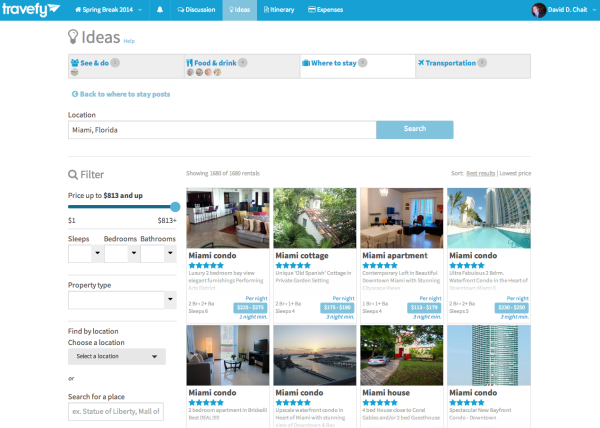 Then select “Where to Stay” and click “Post a new ideas for Where to stay”. 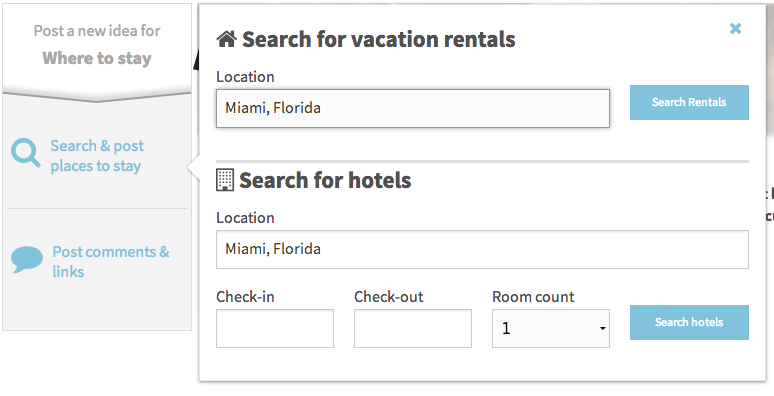 Simply click “Search and post places to stay”, type in the location of your trip, and click “search rentals”. Enjoy your amazing results! 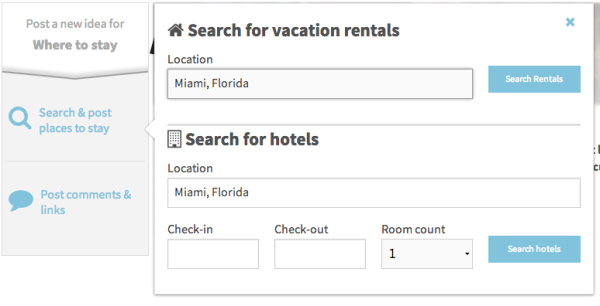 Filter by price, rooms, rental type, location and more to find the perfect rental for you book. Add it to your ideas board, itinerary, and book. How to collect money from your friends for the rental! When inside your awesome Travefy trip, simply click the “Expenses” tab at the top of the screen and click “Add new expense”. Add vital information like the name of the expense, the cost, who covered it, and who owes for it, and then click “Finish and Add Expense”. You can choose to split the bill evenly among everyone tagged or to set specific amounts per person. The expense has been committed. Simply click “Finish expenses and settle up” and Travefy will collect money from your friends, allowing them to pay via credit or debit card. You’ll be able to track their payments in real time and Travefy will pay you back instantly. And did we mention that it’s free to collect on Travefy!